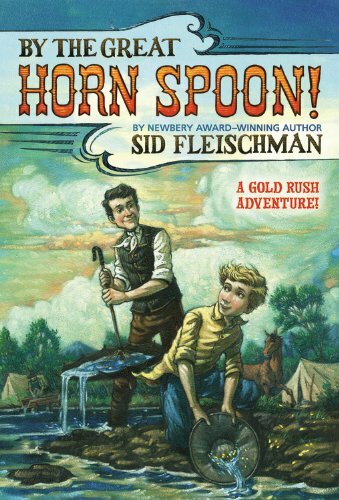 Jack and Praiseworthy must use their wits and resourcefulness if they are to strike it rich in California’s goldfields in this funny middle grades novel. *By the Great Horn Spoon by Sid Fleischman. Little, Brown Books for Young Readers, 1988 (reprint, original date 1963). 224 pages. A scoundrel stole their money, forcing Jack and Praiseworthy to stow away on the Lady Wilma instead of paying for regular passage. To a fine, elegant butler like Praiseworthy, sleeping in potato barrels was rather humiliating, not to mention undignified. To a twelve-year-old boy running away to seek his fortune in the goldfields, “stowaway” was an auspicious beginning to a life of adventure. Jack and Praiseworthy do make it to the goldfields; along the way, they manage to bring justice to the thief who stole their money, earn their keep aboard ship, rescue a pig, and save several folks from financial ruin. California puts their resourcefulness to test, but Jack and Praiseworthy are not the sort to back down from a challenge or to go back on their word, even if it does mean buying a box of random neckties at an auction or agreeing to fight the “Mountain Ox,” a Goliath of a man. Do they strike it rich? Do they make enough money to save Aunt Arabella’s house back in Boston? You’ll have to read it to find out. By the Great Horn Spoon is an absolute delight of a book. Fleischman has a way with words that is both funny and brilliant. His use of figurative language, in particular, makes this book a rollicking read. Clever wordplay and wit isn’t enough, though. Fleischman gives us characters who show tremendous character growth and admirable qualities. Praiseworthy is nothing if not self-controlled and resourceful, even in the direst of circumstances. His calm demeanor and insistence to Jack that they be men of their word is just the sort of mentoring Jack needs. As Jack matures–he even learns to drink coffee!–he comes to recognize what’s really important in life. The two of them consistently treat the people around them well, are always willing to help someone out even at cost to themselves, and form a strong family bond between themselves. This is the sort of book that might not mention the Lord, but the characters certainly display the type of behavior that we Christians would do well to emulate! *indicates a starred review. We’ve reviewed some other gems by Sid Fleischman. Fleischman’s biographies are delightful, as is his McBroom series. Have you read any others you’d recommend? Let us know in the comments! The post *By the Great Horn Spoon by Sid Fleischman (Retro Read) appeared first on Redeemed Reader.